The Airpod is a zero-pollution, air-powered car that wants to change transportation. At 4 a.m., bleary-eyed and barely awake, I spoke with Cyril Nègre on the other side of the world. He was Skyping with me from France, where the company established by his father, Motor Development International (MDI), was quietly working on a form of transportation technology that could change the way we navigate our cities. MDI’s product is an air-powered car called Airpod, and it looks like something that belongs on The Jetsons — half smart car, half futuristic bubble-cycle. If you’re a fan of Shark Tank reruns, you may have seen the April 2015 episode that featured Pat Boone and Ethan Tucker pitching the Airpod. The duo eventually secured $5 million in investment funds for Zero Pollution Motors (ZPM), the US licensee for MDI’s technology. Since then, news has been scant about the Airpod in the US. ZPM’s Facebook page hasn’t been updated since April, and even then, the post was about SpaceX's successful Dragon launch. When I connected with Cyril, I expected to discuss some of the delays facing ZPM’s US development. I didn’t expect to see news on MDI’s website the next day about the passing of Cyril’s father, Guy Nègre, the engineer who wanted to help save the planet. Here’s the status on Airpod — and the innovations that are close to becoming a reality. The Air Powered Car: What Is An Airpod? Guy Nègre — inventor, car enthusiast, staunch environmentalist, and former Formula 1 racing engineer — loved the freedom afforded by cars. Back in 2002, he told Reuters, “I'm a firm believer that the car means freedom and people will not give up freedom, no matter what it's doing to the environment … So the only way to save the planet is to come up with a car that doesn't wreck it." According to ZPM, a single Airpod costs slightly over $10,000. It takes just three minutes to charge from a mobile or gas station air compressor, and it costs approximately $2.00 to fill the tank. Those numbers are potentially game-changing for drivers commuting around major cities — and for cities that want low-cost, high-efficiency fleet vehicles. Who Is The Airpod For? I asked Ethan Tucker, VP of Marketing at ZPM and Shark Tank alum, about the Airpod’s audience — is it for consumers, or is it for the private sector? Tucker framed the Airpod as a “disruptive,” a term that refers to an innovation that creates a new market. And like all new innovations, Airpod’s evolution has seen its fair share of fits and starts — it was originally certified in 2010, but has since faced a series of setbacks that have delayed production. “We signed contracts with some people who did not respect their contract and their financial issues,” Cyril explains. Those delays are over, according to Cyril and Tucker. After years of development, the Airpod is finally making headway — and MDI and ZPM are charging headlong into the future. One final setback needs to be addressed, though: on MDI’s Wikipedia page, a series of updates under “Company History” paint a troubled picture. 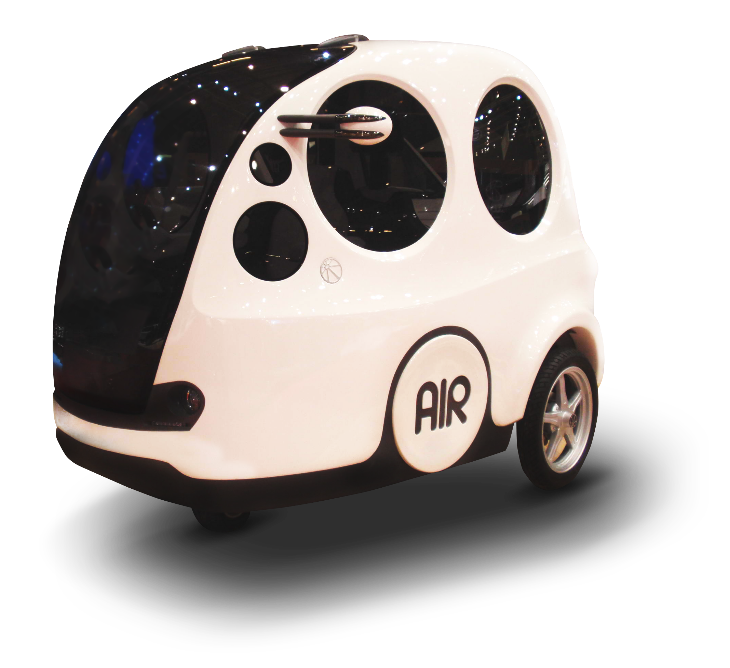 In 2013, “the air-powered "MiniCat" was promised to be on sale in India before the end of 2013” from Tata Motors. The line “MiniCat has yet to be produced” is repeated from 2014-2016. I asked Cyril about this line — and was surprised by what he shared. Guy Nègre described himself as a motorist who also cared about the state of the planet. Through MDI’s development and production around the globe, his vision of a planet-friendly car is finally on track. "My father was the one that innovated … and now, we are going to apply everything that he has developed." Being surrounded by nature has been shown to have positive benefits to mental health and creativity. What they’re really talking about is solar power purchase agreements (PPAs).